This has not been a kind year for aging action legends Arnold Schwarzenegger and Sylvester Stallone thus far. Back in January the Austrian former bodybuilder released The Last Stand, which was a surprising and devastating flop - it opened at number nine at the box office and by the end of its run only managed to make $12 million of its $45 million budget back. But that was nothing compared to Stallone's Bullet To The Head, which premiered at number six when it came out in February, but only pulled in $ 9 million by the time it was done. The good news, however, is that The Expendables movies proved that they enjoy seeing the two action stars team up. And that's exactly what the upcoming film Escape Plan promises. As I can tell from the trailer, which you can see above courtesy of IGN, and the plot synopsis, the film, written by Miles Chapman and Arnell Jesko, stars Stallone as Ray Breslin, a security professional who knows how to break out of absolutely every known prison. When he is about to retire, he chooses to take one last mission at a facility known as The Tomb: a completely under the radar, extremely high-tech prison built for some of the worst, most dangerous criminals in the world. But this is where the story loses me. Breslin is kidnapped and locked in The Tomb...but apparently this isn't part of the plan. Didn't he just sign a deal saying that he would allow himself to be imprisoned? We then meet the warden, played by Jim Caviezel, who apparently isn't the person that Breslin thought it was going to be, but that doesn't really explain his confusion about being locked away. From there the hero is forced to team up with another prisoner (Schwarzenegger) to help him break out, and complete his contractual obligation...I guess. Either there's a big chunk of information missing here, or this movie is setting up one of the stupidest twists in recent memory. Outside of Schwarzenegger, Stallone and Caviezel, the film has a supporting cast filled with names that give me pause for very different reasons. It's great to see Vincent D'Onofrio, Sam Neill, and Amy Ryan, but the presence of Curtis "50 Cent" Jackson's acting talents is typically worrisome. It's fairly hard to see exactly how all of them fit into the larger plot - or what they are doing while Stallone is trying to get out of jail. Swedish filmmaker Mikael Håfström is serving as director on the movie, and his record is a bit of a mixed bag as well. In 2005 he turned some heads with the Clive Owen/Jennifer Aniston thriller Derailed, and followed it up with the solid 2007 Stephen King adaptation 1408. Before Escape Plan, however, his last movie was the lame exorcist flick The Rite. 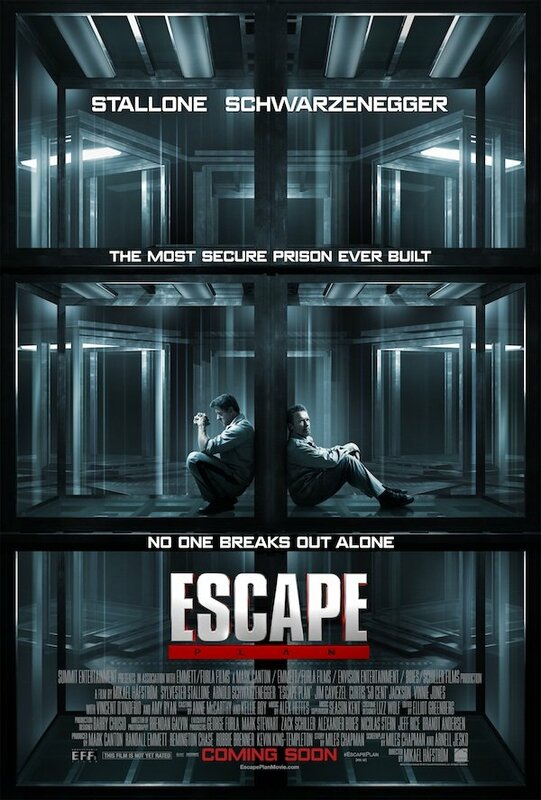 Escape Plan will be in theaters on October 18th.